Three passionate entrepreneurs turn around a rustic lodge - and the lives of the needy youth they employ. (FSB Magazine) -- Growing up in a struggling family where he was shuttled among relatives for years, Ted Smith, now 24, says he spent much of his teens and early 20s abusing drugs and alcohol. Then, in December 2003, a friend who was driving him home from a party slammed his car into a tree. Smith wound up in a hospital for two weeks with a broken femur - and a determination to make a new start in life. 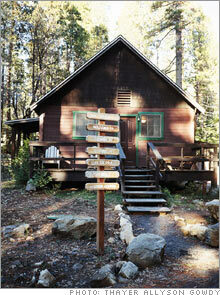 Six months later the San Francisco resident heard about an internship program for underprivileged youths at Evergreen Lodge (evergreenlodge.com) in Groveland, Calif., near Yosemite National Park. The resort wanted 18- to 24-year-olds to work at housekeeping, cooking and other jobs. Smith, who had gotten treatment for his drug use, immediately applied for a dishwashing position and in June 2004 was hired at $7.50 an hour. He quickly mastered new responsibilities as a line cook. Rustic Renewal: One of the original cabins (above) that founders (from left) Zimmerman, Anderluh and Braun had to overhaul. In December 2004 he and his girlfriend, a front-desk clerk he had started dating, moved to her family's home in Las Vegas, where he got a full-time job as a fry cook at a hotel-casino. He then married his girlfriend, and they are saving to buy a two-bedroom house, where they hope to start a family. They recently moved to Lincoln City, Ore., where he found work at the Chinook Winds Casino as a saut� cook. "I grew up poor, and no one taught me any other way to live," he says. "At Evergreen Lodge, I learned there's more to life than I'd realized. The lodge helped me turn my life around." Evergreen Lodge is a rare phenomenon: a business that has achieved its dual mission of giving back to society and earning a profit. While building its thriving internship program, Evergreen Lodge achieved about $3.5 million in sales for 2005 and should exceed $4 million for 2006. 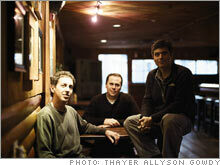 The founders - marketing executive Lee Zimmerman, 42; his Stanford Business School roommate, Brian Anderluh, 39, a former Internet executive and Dan Braun, 38, who runs a mountain-climbing tour business - made their first distribution to investors in spring 2006. They are considering buying other properties, such as a hotel, where they can add similar internship programs. Tom LaTour, former chairman and CEO of Kimpton Hotels & Restaurants in San Francisco, recently joined their board and is helping plan their next steps. Early on the company's founders discovered from their business contacts that helping underprivileged kids opened up little-known sources of startup money that aren't available to many small businesses. These pools included grants and venture capital set aside for community development, and equity capital from investors with social goals. Zimmerman attributes the company's success in fundraising to its unique business model and "our tenacity and relentlessness in tapping the ill-defined capital market for such ventures." By avoiding conventional, more costly sources of financing, such as traditional venture capital - which would be hard for new entrepreneurs in the hospitality industry to obtain, in any case - they insulated themselves from outside pressures to scale back the internship program in the early days when money was tight. Running it costs about $150,000 annually, because the lodge employs a full-time manager for the youth program, provides an outdoor recreation program for the interns, and subsidizes housing for both the staff and interns. "Companies like this one have to strike a balance between their social goals and their financial return," says Rick Aubry, a lecturer in social entrepreneurship at the Stanford Graduate School of Business. "The successful ones are the exception rather than the rule." The internship program has also helped lure committed employees to the out-of-the-way lodge's 60-member, full-time team. "We have been able to attract fantastic staff whose priorities are aligned with ours and who have the kind of compassionate personality that is a good fit for our industry," says Zimmerman. Barbara Messing, a 35-year-old vice president of a San Francisco Internet venture, has visited the lodge three times with her husband for two-night stays. A frequent visitor to Yosemite, she says the lodge offers a happy medium between camping and expensive hotels, providing amenities such as hot showers without sacrificing its rustic ambiance. The friendliness of the employees has also drawn them back. "The staff are very eager and helpful," she says. With the internship program established, the founders plan to start emphasizing it in marketing materials that they will place in the cabins this spring to draw visitors who want to help young people. "It will differentiate us from competitors," says Zimmerman. In 2000, Zimmerman and Anderluh decided to start a business that would help the disadvantaged. Not sure where they could make the greatest contribution, they sought ideas from Juma Ventures (jumaventures.org), a Bay Area nonprofit that provides jobs and social services to low-income youths. The organization had just received a grant to establish an incubator for profit-making businesses that would provide job training to needy young adults. Zimmerman, who had recently left a marketing position at a San Francisco restaurant chain, and Anderluh, who had also just left his job in business development for an Internet greeting-card firm, agreed to launch the first company in the incubator and received a $150,000 fellowship to do so. Deciding that outdoor recreation was a business that they could master, they set out to buy an appropriate venture. Teaming up with Braun - who runs a successful mountain-climbing business - Zimmerman and Anderluh bought a family-run guest lodge for wilderness travelers for $1.25 million in 2001. They envisioned offering internships that would train needy 18- to 24-year-olds in skills including cooking, housekeeping, maintenance and carpentry. The lodge would provide social services such as career-planning sessions while giving interns a chance to hike, bike and kayak. To buy and renovate the lodge with 50 new cabins, the three partners raised a total of $10 million, taking out loans and obtaining equity investments from a variety of public and private sources. Although upgrading the resort was difficult - contractors had to haul supplies to build the cabins through remote woods - achieving the company's social goals was tougher. The first summer, in 2002, the lodge recruited six interns from social-service groups and the Job Corps. The founders decided generally not to include those who lacked work experience or needed costly medical treatment for problems such as drug addiction. It would be too expensive to add the necessary staff and resources. They paid the interns $7.50 to $8.50 an hour. Not every hire worked out. For starters, the partners hadn't realized just how foreign the lodge might seem to recruits, many of whom had never been out of an urban area. Two of the six interns left before their four-month internships ended because they missed city life. Determined to attract career-oriented candidates, the partners contacted more vocational-training agencies the following year and fine-tuned their job descriptions. They also learned to be firmer with interns who showed up late for work, firing them if necessary. To retain recruits, they teamed each intern with a specific staff member and had supervisors meet with them regularly. They also extended internships for those who needed extra help. Alma Escalante, 23, a Salvadoran immigrant with a history of depression, was living in a San Francisco youth shelter before a case worker there found out about a housekeeping internship at Evergreen Lodge. When Escalante's internship officially ended and she had no place to go, she stayed on as an intern to save money for college. "Evergreen Lodge has been a lifesaver," she says. So far, 40 youths have completed the internship program, which now includes about 20 recruits a year. Many graduates have won full-time jobs. After his recent internship, Roy Edwards, 24, of Richmond, Calif., found a position in maintenance at the tony Lambourne Hotel on San Francisco's Nob Hill. "I'd probably never have gotten this job otherwise," he says. To give feedback, please write to mailto:fsb_mail@timeinc.com.